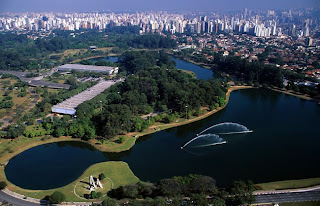 Ibirapuera park is a major urban park in São Paulo. It was inaugurated in 1954, in commemoration to the 400 th anniversary of The city. The design of the buildings was done by Niemeyer, and the landscape design by Burle Marx. Ibirapuera Park covers an area of almost 2 square kilometres. The name means rotten tree in Tupi-Guarani, and comes from the indian village based in the region, when the area was flooded.